The spot silver market took a breather on Friday, much like gold, and paused for breath following the strong breakout of Tuesday which propelled silver prices above $19.50 per ounce and beyond. 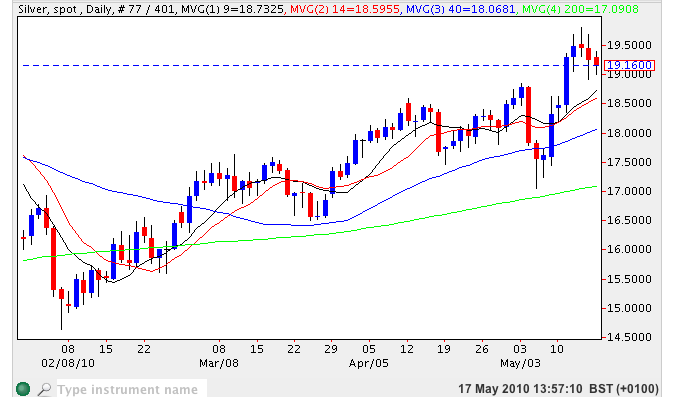 Friday’s doji candle coupled with Thursday’s minor shooting star is currently signalling a short term pullback for silver prices which we have already seen in early trading today with the industrial metal currently trading around $19.11 per ounce. This downward’s move is likely to be a temporary one and should therefore be seen as an opportunity to open further long positions on the expectation of the bullish trend continuing in due course. This is further confirmed by all four moving averages which are pointing sharply higher and with the deep resistance now below in the $18.50 price level this should be the extent of any short term reversal. Longer term we should expect to see silver break towards the $21 per ounce region.